Guess what your fired – Now what? Has this happened to you or do you fear this happening to you one day? Probably – Maybe we all do! 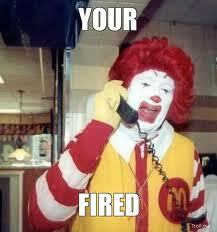 But, don’t fret because there is something wonderful about being fired…. Who else shared in this ultimate form of rejection? Why were these people successful after they received the harsh feedback of “you’re fired”? They looked in the mirror – self-reflected – realized they needed to improve – decided not to fail – focused with confidence – developed resilience – and overcame all obstacles. They persevered because they envisioned winning and were willing to do what it took mentally, physically, and emotionally. They found themselves after being fired! Maybe being fired is not something to fear but maybe something to embrace. Let the challenges begin – onto the road of empowerment.